For the past year the living room has looked a little bland. We had a TV (which didn't work for a couple of months because we decided that since the antenna wasn't working anyways why add another distraction to our time; but we caved, bad and bought rabbit ears) and courtesy of ikea a coffee table and a couch. We had a bunch of mismatched pillows and throw blankets, so basically a great place for napping but not for congregating. 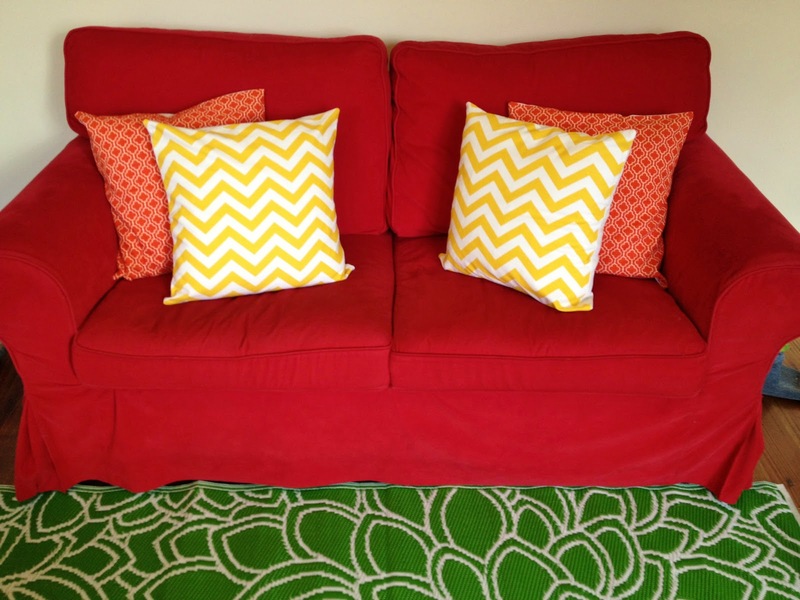 So I figured a quick makeover for the couch and a new rug would change things up a bit. I got these two fabrics to match our red couch and since I only order 1/4 yard in one; I had to do plain backed cushion cases with the nice fabric on the front which suited me just fine since no one sees the back, and I get to keep the left over fabric for ID wallets and such. 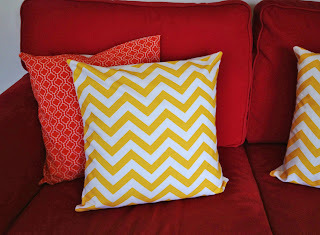 This is one of the easiest items to sew since it's all straight lines and a zigzag stitch will secure the edges. Place the patterned fabric face up. Align the edges of the short rectangle with the patterned fabric and pin. Align the edges of the large rectangle with the patterned fabric and pin. You can stitch around with a straight stitch and then hem the raw edges with a zigzag stitch or I found the opposite way to be easier. By hemming the raw edge first the pieces held together perfectly and when it came to doing the straight stitch I could just zip straight around. And that's basically it, the quick way to make cushion covers. You could add a zip if you like or studs if you don't have enough fabric but this is a great beginner's project.